Protecting vulnerable people, such as victims of domestic abuse, is a key priority for the new North Wales Police chief constable. Carl Foulkes, a deputy at Merseyside Police, takes up the role in November. He said the murder of a woman and her two daughters in the West Midlands in 2003 had focused his efforts on tackling domestic abuse. After serving in the Royal Navy, he worked for the British Transport Police before joining the West Midlands force. His appointment was confirmed on Monday by the North Wales Police and Crime Panel. Mr Foulkes, 47, is originally from Caergwrle, near Wrexham, but his family moved away when he was young. Mr Foulkes was involved in a murder investigation following the death of 25-year-old woman and her young daughters. The man accused of killing them was later found hanged in prison. "When you see something like that in such a young family that had everything going for them, you realise that we need to do something different for the future," he said. "We shouldn't be having those incidents." He has also pledged to tackle serious and organised crime, particularly so-called County Lines cases where gangs from cities such as Liverpool and Manchester "seek new territories for their drug dealing networks". 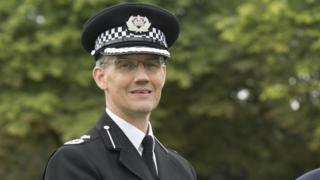 North Wales' former chief constable, Mark Polin, stood down in July.